“Upon the banks of the Sychnant, this bold rock stands close to the Bwa Maen, or Stone Bow. Witches appear at one time to have flourished in this neighbourhood, for more than one of their chairs are still in existence...The witch to whom this particular seat belongs, was in the habit of sitting there, and weaving her incantations in the shape of a stocking – an unusually good and useful result for such doings. 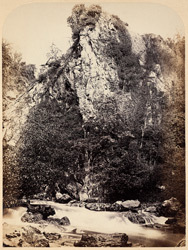 She threw the ball of worsted, which was made of the wool of a Welsh sheep, across the ravine on to the opposite rock (Craig y Dinas), and continued at work till the ball was unwound. If the thread broke, the life of the person for whom the spell was made would be measured by the quantity of stocking completed; and according to the mode in which it was broken would be divined the probable cause of death.